Music was an integral part of the Mayan culture. It was an activity performed by both grown-ups and young, rich and poor. Musicians were asked to perform at many ceremonies. At the time of important events like funeral ceremonies musicians were invited to play music. 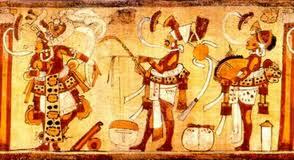 Mayans also celebrated war victories with the help of music. On social events like games, music was as a necessary factor. Thus, music formed a part of all Mayan ceremonies and events. Musicians during the Mayan period were given a lot of respect. Mayan people, whether rich or poor had deep interest in music. However, a few of the musical instruments could only be used by the rich and so it can be said that music during this period was associated with status. Mayans used a wide range of instruments to create musical tones. Diatomic Marimba was a musical instrument used by them. Marimba was an instrument which had a set of wooden bars with resonators. Rain stock was considered to be an important Mayan musical instrument. Flute was a common musical instrument used during that time. Animal shaped flutes known as ocarinas were also a musical instrument. This flute was either made from ceramic or bones. 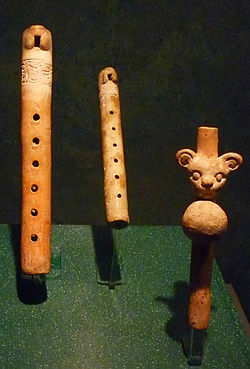 The other type of flute was clay flutes. Flutes were either made from wood, reed material and bones. The Mayans also used several other musical instruments like drums, maracas, shell horns, stones, whistles, castanets, wooden trumpets, clay flutes and reed pipes. Two types of drums were used by the Mayans. One of them was a vertical drum made out of a hollowed trunk of a tree and wrapped with animal hide. The other drum was a 'u' or 'h' shaped drum. The Mayans created music by rattling together turtle shells. Tortoise shell and pottery flute were used as musical instrument by the Mayans.